Java-based CI tool that supports arbitrary shell scripts, SCM tools, and Windows batch commands. Eclipse Hudson Reviews Recently Reviewed! Pros: I utilize key-mapping a lot when I code, and have found Eclipse in general very easy to map my own keys. Something as simple as "Copy last line" speeds up my ability to code in Java considerably, and I have found adding this functionality simple and intuitive in Eclipse, moreso than Visual Studio. I am also a fan of the overall amount of customizability, especially in color themes, as it is very hard for me to program with a background that is not dark. Check out their "Darkest-Dark" theme, I found it to be great for long coding sessions! Cons: At times I have felt there were unnecessary extra features that I had to end up disabling to make my workflow less cluttered and quicker. Namely with text prediction, and some of the Eclipse hints that are provided when writing your syntax. It really depends what I am coding though as I have gone back and forth on turning these features on and off, it really depends on the type of project I am working on. Overall: I feel I am able to code much quicker than my counterparts when using Java due to the hotkeys I can map with this IDE. There is a noticeable difference in how quickly I can produce the same code as others, and I likely wouldnt have really delved into that practice without this IDE. It also has been great for my eyes, with easily re-sizable text and great, dark color themes. I get a lot of eye strain from improper themes, but found their "Darkest Dark" to be just perfect for my eyesight! Pros: * It has a text editor with syntax highlighter. * It has unit tests with (JUnit). * Version control with (CVS). 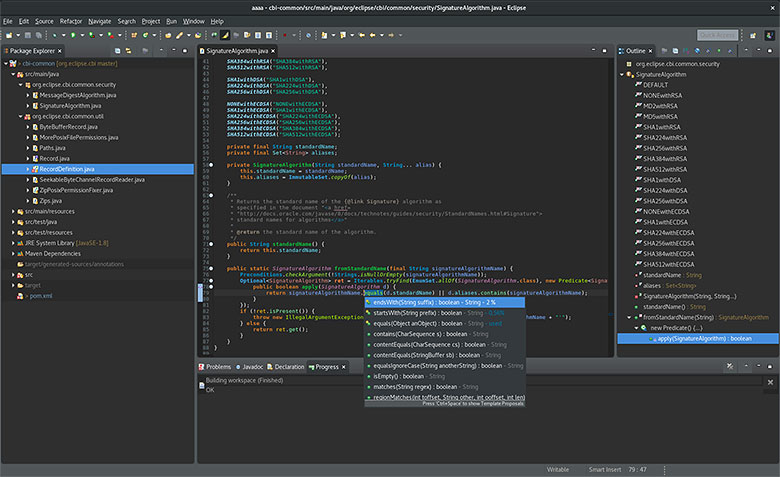 * The integrated development environment (IDE) of Eclipse employs modules (in English plug-in) to provide all its functionality in front of the rich Client Platform, unlike other monolithic environments where the functionalities are all included, the need for them user or not. * This module mechanism is a lightweight platform for software components. In addition to allowing Eclipse to be extended using other programming languages such as C / C ++ and Python, it allows Eclipse to work with languages for text processing such as LaTeX, network applications such as Telnet and Database Management System. Cons: * mainly, common to other IDEs to a greater or lesser extent, in the consumption of system resources. * Also it lacks a lot of support for webapps (.war, jsp and servlets) just like netbeans does. (The plugins are usually not as powerful or as simple as the module that Netbeans comes preinstalled). Pros: Eclipse is a widely used freely available IDE for Java programming language. It comes with too many great features like code auto completion, compile time errors, Java server integration, syntax highlight, file searching across project. Every Java web application developer if not using Eclipse is missing the ease of writing code that it provides.Multiple tab support is good. Eclipse allows you to directly go to a method on different file by clicking on link on same tab. Overall: We are working on institute management system that is a web application written in Java. The benefits we have realized that our development efforts has speed up by this IDE. Eclipse provide so many great features. We are mainly using Eclipse for writing code, search across files, find and replace, Server integration, Running JUnit test cases and build tools integration. Cons: There are no cons, but if i want to mention one i will go for Stability. Which i feel somewhat missing if we consider huge Web projects deployed in eclipse. 1. Using IDE will cost you less time and effort . 3.Auto completion- one of the best features , you don't have to remember all. 5.Error debugging is easy , you can easily navigate to Error line. 6.All files can be viewed and managed at same screen. 7. Organizing you imports. its very quick using wizard provided. 8. Downloading requires packages at ease. Pros: The main concern of mine with eclipse is programmability in java and python. It makes the programmability with java very easy. Even if there is syntax error in your code you don't have to compile it. It automatically shows the red dot which means there is error in your code. You dont have to compile it again and again.you can also do the programmability with python in it. You have to add some classes for it. You can also share the packages with whole in you team.no need to go on notepad and on cmd to run or compile the java code. Cons: The size or jdk compatibility of eclipse. Sometime it took many time to make your eclipse compatible with the jdk you have in your machine and sometime it looks lots of memory and slows down the whole your system. Pros: 1) Can be supported to all the operating systems like Windows, Mac, Linux etc..
2) It's a free and an open source. languages like c, c++, java. 5) The inbuilt compiler which makes the error navigation so easy. 7) Can download plugins which are used to developers in an easy way. 8) Can rename a class which is created. 9) Can be used to schedule tasks and keep a reminder of all the incompleted tasks. Cons: I did not find any flaws with this software. Overall: While learning java we sometimes get confused with the completion of syntaxes of classes. But in eclipse IDE with the help of autocompletion, I only have to remember the functional use of a particular class but not the whole syntax of the class. Another important feature is Refactoring means we can change the name of the class. We sometimes make some typo errors which specifying the names of user-defined classes in java. In that case, the refactoring feature helped me. As packages can be installed in eclipse with ease, I was able to download servlet package in java for server related code. As plugins can be installed easily, I have downloaded two plugins related to unwanted code removal and python. I have created a sample web application with the use of HTML, servlets, Java and hosted it within a web server. My overall experience using this software is so good as it is highly recommended for the beginners. Its a Best software for JAVA Person. I love it. Pros: Flexibility and creation of code through just some selection of buttons. I am using it since 5 years and i liked it compared to any other one's. Its easy to debug and can generate automatic codes with numerous software. One must use it from beginner to advance level. Moreover, best thing is its free available in eclipse.org website can be downloaded and installed for any OS. Cons: Rarely it hangs the other software running but might be other issue like RAM compatibility. Or background CPU Load so cant blame eclipse really for that. I personally feel its because of software i use it decrease the speed of computer and other software. Pros: Eclipse is Java IDE ( Integrated Development Environment ) user widely for developing, managing, debugging Java applications. We can customise the environment using as per need and can add plugins. It can also developed applications via plugins in other programming languages like C++, Ruby etc. Moreover its free to use and testing tools liie Selenium can be added for testing and debugging purposes. Cons: Due to various jars and plugins import, sometimes it slow down the system. Overall: I have been using Eclipse for developing Java based applications for official and personal uses. Its been quite easy and fully functional with features. Good IDE for a programmer to get started! 5. Support for external libraries such as TestNG, JUnit and others. Cons: Can be more intelligent just like IntelliJ. At times it hangs and gets stuck when lots of tabs are opened. Can support JIRA and Slack for easy collaborations and result sharing. Overall: We have used it for Automation framework development for UI and APIs. Pros: Eclipse is a software that works as an integrated development environment (IDE). It is easily available as it is an open source software. Best feature of Eclipse IDE is that it is compatible with various coding languages. It is having better GUI features than other IDEs. Overall: Overall experience is pretty good. I would like to score this software as 8 out of 10. Pros: I found Eclipse to be very intuitive and simple to use. I like how it can save multiple projects in a workbench and it's easy to navigate between projects. The debugging feature worked flawlessly on my end. I also enjoyed downloading different plug-ins for eclipse including using version control support system. Cons: At rare times, my projects would not build correctly (compiling to .class files) which then I had to manually do so myself. So far the only con I faced. Overall: Great java programming IDE. Been using it for 4 years and I it is my to go IDE. Pros: I suppose the name is nice? And it works, sometimes. Most of the time however it does not. Performance has increased over the years, which is not a huge accomplishment. It's kind of like a burning building: "Well the flames have gotten smaller, so that's nice" "Sir that is because the orphanage is now literally just ruins and there is nothing left that even COULD burn!" So yes, performance is better now than it was years ago. Still not fantastic but servicable. Cons: I don't even know where to begin. You will probably experience Eclipse if you start learning programming with Java as your first language. 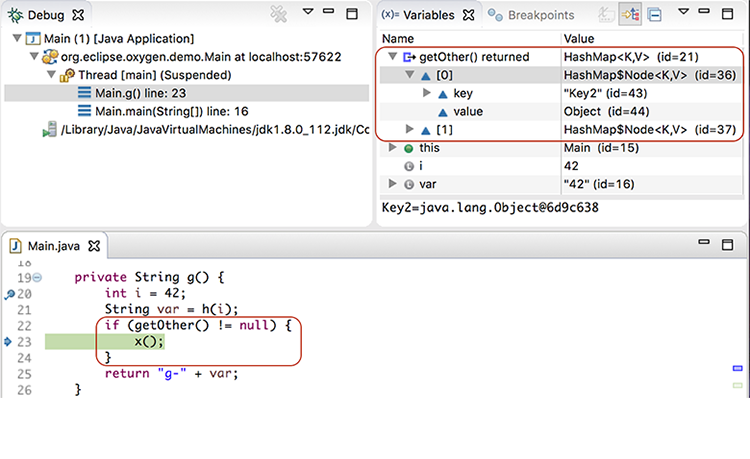 If you already know a programming language for a language other than Java, chances are you have already read the horror stories about Eclipse and know to avoid it. If you have not, please do not use Eclipse. Use IntelliJ or any other IDE. Eclipse is slow and sluggish though as I mentioned that has improved. The interface is confusing and unintuitive, off the top of my head: To install new plugins you need to go into the "Help" menu and there in the dropdown you can find the option. Eclipse is like the cookie monster, but for memory instead of cookies. It WILL eat up all of your memory and there isn't much you can do to make it stop. Eclipse seems to be non-deterministic, which is kind of cool from a computer science standpoint, but bad from a user standpoint: Something that works on your colleague's installation may not work on yours despite there being no logical reason for it to be that way. Just don't use Eclipse. If you work with it for long enough I guess you can get used to it and get things done fast, but if you are new and considering Eclipse you should probably just use any other IDE. Pros: I like that it saves lots of time in knowing apis for Java , WebDevelopment project . Eclipse provides the environment for Maven , testNg , Junit all the testing frameworks also which helps in writing the automated testcases . Cons: Some more beautiful themes should be available which is misssing I guess . 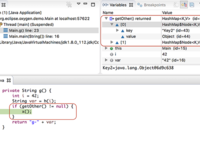 Overall: Being a Java developer , I use eclipse daily and found it very useful for any developer . Writing code without Eclipse IDEs is very difficult , it saves a lot of time . It provides an evnironment for web development and all frameworks . Pros: It is very easy to use. Debugging feature is very useful where we can add breakpoints and check the values int he variables at various intervals. Import function to import existing code is also quite useful. The basic eclipse IDE is made for Java but it has so many extensions for other languages like pyDev for python, and others for C, C++ etc. Cons: The application is takes up a lot of resources it is difficult to run anything else on a machine that has less memory. Pros: The best thing I like about Eclipse is I don't have to remember many things the autocomplete just help me choose what I wanted to write next which is an awesome feature about Eclipse. Overall: Product development made so easy with Eclipse and faster writing of codes and better search options which eases our life instead of searching manually. Pros: Eclipse is a platform that will help you build any kind of projects right from a basic Java or HTML program, to developing huge scale Android projects! It has numerous functionalities that help make the coding experience smooth for the developer. Definitely worth every penny! Cons: Some recent versions like Eclipse Oxygen take a lot of time to load in the beginning. Overall: I have used Eclipse for both professional as well as personal projects. Never has it failed to build any kind of project. Pros: Very fast and flexible for coding especially in Java, for novice to Enterprise level companies. This provides complete soltion for implemeting any kind of application. Cons: As such there is nothing that ai dont like, still some good features provided by Visual Studio which lacks in eclipse like very standardized shortcuts foe moving within opened tabs. Overall: Single master tool for all applications, which further connected to number of markets and code archives. Pros: I like that it is free! It runs on Linux, Mac, Solaris, and Windows. Shows syntax errors and warnings with highlights that make its easy to find. Debugger is great has the hover over ability to show variable values which is very useful. Eclipse also has a built-in incremental compiler which provides you with real time error reporting. Lastly, The eclipse market place has many plugin you can utilize. Cons: Eclipse is a resource hog, it can run really slow after long use. After leaving it open all day it can consume more than 2 Gigs of ram. Also, The occasional crash is not fun. We did switch to JBoss which seems better so far. Overall: Writing java libraries with an IDE is helpful to speed up programming. Eclipse helps me in that it lets me easily integrate libraries/frameworks to speed up my development at no cost. Pros: Easy to install and use. UI is very simple and self-understandable. Have plugins for mostly everything. Integrates easily with JIRA, GIT, SVN, Maven, ANT. Its a fun tool to work with. Cons: I don't see any shortcomings about the tool. It is simply the best and perfect by all means. Can add a feature to show References above all methods, classes and variables like it is shown in Visual Studio. Overall: Writing automation tests for UI Automation. Pros: Java development has been made easy by eclipse. Writing code is faster with its autocomplete and syntax checking features and I must say debugging is excellent. I liked the fact that is was especially easy to customize and it quickly organizes my imports. Cons: Start up is way too long and it consumes plenty RAM. My only other issue is that it is not as smooth when working between multiple machines. 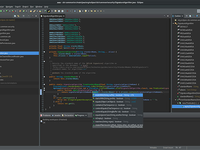 Eclipse is very good IDE to develop java based applications using its advanced features and plugins. Pros: It has wide range of plugins which provides great functionalites in java Development. It has quick suggestions to complete the code statement. Debugger is also very useful and fast to debug mobile applications issues. Cons: Sometimes it crashes while doing multi tasking. Loading time is bit more that normal it should be improved. Overall: I am developing mobile applications and doing auto testing of various java code modules. 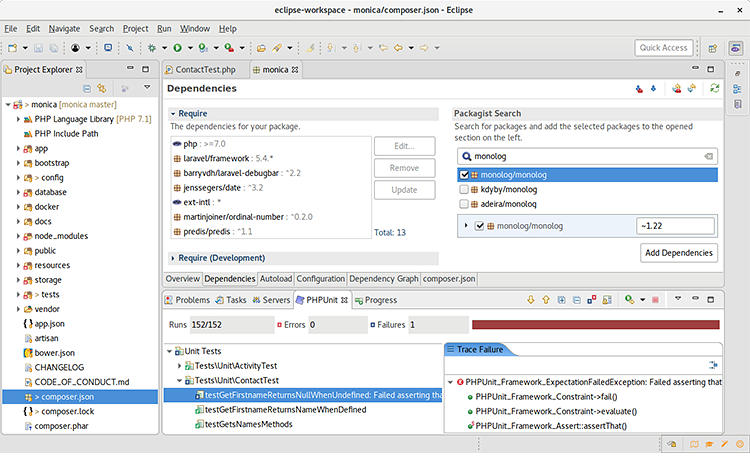 Pros: Eclipse is an IDE( Integrated Development Environment) developed in Java for building Java applications. It workspace with customise add-on system helps to develop in other programming languages like PHP, C++. Cons: Importing of project slow down the sysrem very frequently. High quality components and perfomance. Pros: Debugging and depuration mode. Cons: It consumes a lot of ram memory, the development for the components is of very high knowledge of java. Overall: Organize and implement development with framework, debugging and implementation of java language, as well as loading servers such as tomcat, among others is scalability. Pros: I am using this software from past 5 years and i find it very user friendly. It seemlessly integrates other plugins and extensions. Lot of third party plugins are available in its market place. Cons: Its a memory hungry software as it requires lot of memory space. Sometimes the application running hangs up. Pros: It a ide for java and other languages. You can install many plug-in to help you to build your application. The autocloplete it's very useful. Cons: with linux some time i have strange problem with the interface, it use a lot of RAM. If you have many plug-in it became slow to start. Easy to use and create java based applications. Pros: It provide easiest way to build window and web based application. Debugging feature is very advance. Is saves a lot of time as we can merge code with new changes easly. Easy to mange large and complex code. Cons: It should include third party library ibhuilt so that we can easly include it in application. I think this feature will save more time. Overall: Customers always wants to complete project in short time of periods, so it gives easy interface to devliver there projects on time. Cons: Eclipse is great for Java Development and Java Frameworks. There is nothing to dislike about it except for the loading time. Pros: I most like the fact the eclipse id open source and free, therefore, updated on a casual basis with the latest technologies. Cons: I leas liked the fact that in order to write or edit deferent languages code, we will have to add plugins in order to navigate between file types. Pros: It provide all the feature like syntax error checking, whoch helps beginners to fix the issues easily. It provide plugin like TFS which is helpful for team work. Cons: It doesn't support other languages like c#, .Net and many others. Also. It take time to load project. Cons: Running full scale projects on eclipse is not as easy to do as on IntelliJ. Especially projects that have libraries that might have code in other languages. Pros: The best functionality is autosuggestion and auto compilation.When you start coding it starts compiling side by side which saves time . Is it an excellent text editor. Pros: I like that it has available a bunch a plugins and that make the tool even better, it has a nice interface. Cons: I do not like that sometimes it gets frozen when you try to open big files, also when your are searching for something it is very slow. Cons: It takes lot of memory to run, the system will be slowed down if we open multiple projects or a project with large number of files. I used the Eclipse IDE for programming in Java and C++ back in high school. Pros: I like the fact that it is a very sleek IDE and it is easy to use. That and the fact that you can use it for both C++ and Java really made it a great IDE for the computer science class that I used it in. Cons: I do not like how, at least the version I used, the IDE couldn't tell you exactly what was wrong with your code, it just told you where there was an error, and I believe what type of error it was, but not exactly what was wrong like some IDEs can do. Overall: The benefit of not having to switch IDEs if you are switching from coding in Java to C++ and vice-versa. Pros: This is a very reliable java IDE for all the Java developers. The suggestions given by the IDE is really helpful. And also having facilities to change the themes and User Interface make the software very user-friendly. The marketplace has so many necessary plugins to download when needed. Integrated GIT helps you to share the code among your team. Cons: Ram usage is little bit high. But if your using a system with 8gb ram then that won't be a problem. Time taken to start servece like tom cat feels littel bit high. Pros: It comes heavily loaded with lots of features, including git and comparison tools. We can even go back to code in any point of time in history and retrieve it. Pros: I liked the interphase, the ability to change the colors/themes, and the ease of use. It was fairly easy to use and made learning how to code in Java not too difficult. I had to use this software for my college computer science classes, so I would use it basically every day. Cons: The thing that I liked least about it would be how it seemed more catered towards intermediate or above coders or at least somewhat experienced coders. Therefore, navigating it at first was a little tricky to understand, but I got the hang of it. Eclipse is the evolution of multi platform IDE and its very easy to use. Pros: I have been using it for java and python application development and the auto completion feature in this helps me to write my code faster and when compared to other IDE i feel more comfortable with eclipse. Pros: For Java/XMLs that i needed to use is pretty good and useful. also the integration with clearCase was nice. Cons: Slow in big projects. the integration with GIT is not comfortable (for me at least). Pros: We can use this not only for java implementation but also other languages such as ADA, C, C++ etc. Does needed indentation automatically . Can be use for create both web base and console applications. Eclipse allows us to install external libraries in eclipse market, so no need to go to the browser. Cons: Startup taking long time. Sometimes refresh the program is a must. Overall: I am able to code fast than others by using eclipse. Eclipse IDE is what I use as an engineer of 15 years. Pros: It's VERY robust. To speed up load time, I can "close" projects I'm not using. When left open, they'll load with the IDE. On rare occasion I need to see how to use some PHP functions in an arcane way, and Eclipse gives me access to the PHP Manual to do it. Plus, I can click through from a custom function, class, method, or the like, and it'll take me to its definition. Cons: I don't like the fact that it's so heavily bug ridden that I'll need to cut and paste the whole file to make it resume syntax highlighting, or the fact that it constantly tells me whenever it crashed, yet nothing appeared to go wrong. The constant popups to tell me something broke when nothing did should really be sending that data to a log. As only engineers use the software, we know enough to check the logs if we need to find out what happened. We don't need to click "OK" seventy times so we can get back to work. In theory, only quality engineers would be allowed to work in that capacity, yet sadly that's not the case. Eclipse really needs to solicit for help from the big guys or at least have some kind of better quality control for their OS software. Overall: It's the only one that does what I need, even if it's bug ridden. 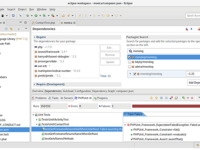 Eclipse is an IDE that uses for JAVA developments. Pros: 1. The best tool for software automation. 2. Have many plugins that help to code easily. 3. Easy to use & understand. 4. Most of the automation tutorials are done using by eclipse. 5. There have many java libraries that help to automate the application. 6. Support for multiple platforms. Cons: 1. Nothing to mention about the disadvantages. But once I updated my windows machine, installed eclipse software got crashed. Overall: For my all the automation stuffs eclipse was the solution & it helps me to learn more about the automation. Pros: Free to use and full of features, this IDE has everything any developer needs to be productive on a daily basis. Cons: Downside is that larger projects can hinder performance of the IDE with longer index times and loads of threads. Overall: The wealth of features out-of-the-box and extensibility through plugins make this a great IDE for any type of project. Pros: I LOVE using Eclipse to code, it shows you exactly where there is an issue in your code by underlining it in red, and offers you a "quick" solution in order to fix it. Cons: The computer generated "quick fix" can sometimes make your code more messy and does not actually make your code work. Cons: It is somewhat of a resource hog, as it uses up quite a bit of RAM. Would not recommend using on older hardware with less RAM as it will be slow. Not much of an issue with newer and even average hardware in my experience. Overall: I first got introduced to the IDE in a programming class in university. Since then I've done all my (school and personal) Java projects using it. It's been perfect for all my needs so far, and I haven't run into any problems with it.